Heat oven to 350°F. 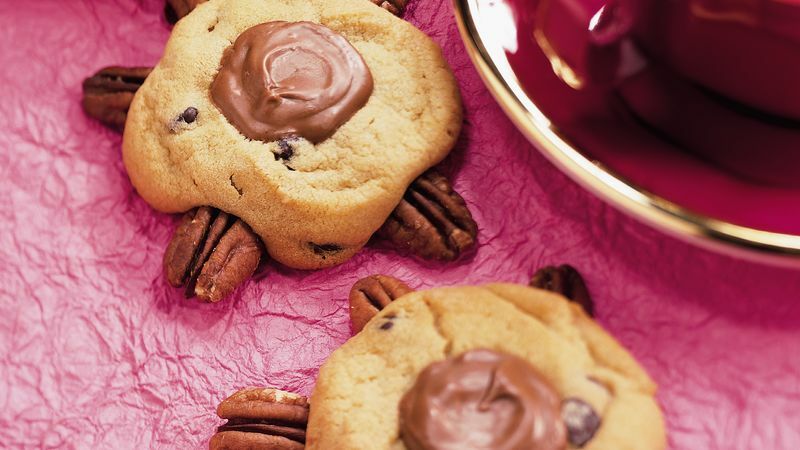 For each cookie, on ungreased cookie sheet, arrange 5 pecans to resemble head and legs of turtle. Top pecans with unbaked cookie. Bake 10 to 14 minutes or until golden brown. Immediately press 1 candy into top of each cookie. Cool 2 minutes. Remove from cookie sheets; place on wire racks. Cool an additional 4 minutes. With knife, spread softened candy on each cookie into 2-inch round. Cool 1 1/2 hours to set candy before storing.